Modern vehicles have taken up the call, pun intended, to integrate with cell phones. It is not surprising either, as a recent report has shown that there are more smart phones and mobile media phones than there are people in the world (independent) and that the average person spends 2 hours plus a day using mobile apps (Cnet). That equals an outstanding 730+ hours per person per year. Because apps and cell phones have been at the front of automobile safety, resulting in much legislation preventing the use of certain applications, phones, and features, Apple and automotive manufactures have joined together to create Apple CarPLay. Apple CarPlay is an IOS based integrated system which couples the Apple mobile device with selected vehicles. The Apple CarPlay system allows the user to get directions, make calls, send and receive messages, and listen to music. Though the information is presented on the touch screen display, it is not the infotainment system. 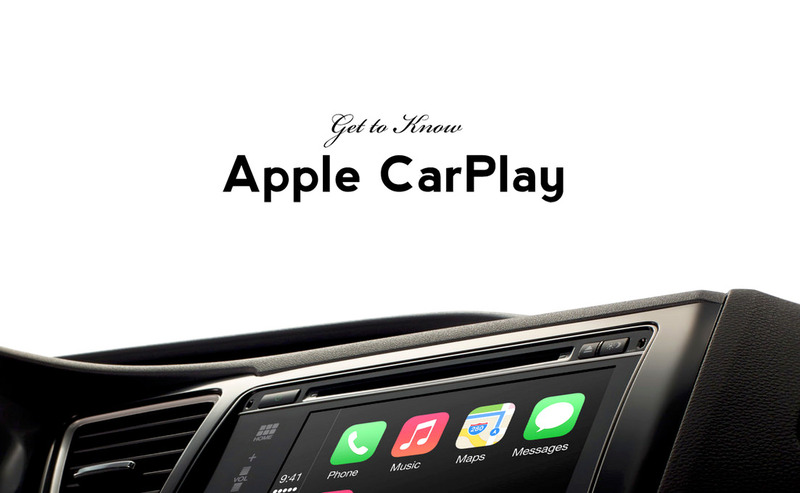 The CarPlay is a separate application which utilizes the features of an existing phone to the car much in the same way that the CD to Tape deck adapter functioned in earlier years. Perhaps one of the key benefits of using Apple CarPlay is that it bypasses the text and messaging regulations which are in place in several states. To explain. By having the texting and the phone running through the vehicle, the driver is able to keep both hands upon the wheel and their attention on the road. Since they are not technically using the phone to send or receive messages while driving, but rather are using part of the phone’s functionality alongside the built in voice commands of the vehicle it may be possible to send and receive messages in this manner. Drivers should check with their local DOT on the restrictions of such features. In addition to the texting and messaging, the IOS based Apple CarPlay allows for the user to have his or her playlist and preferences from his or her Apple Phone to be “transferred” to the car’s audio system. This allows for the user to have preferences loaded, song lists, and such information at hand without having to go through the phone or surfing radio stations to find a match. The obvious downside to having Apple CarPlay is that it is an IOS system. This limits the number of users which can take advantage of the system (as there are more Android users than there are iPhone users currently). The rollout of the Apple Carplay has been a bit slow, but this is happening with all major car makers. Secondly, the Apple Carplay is not wireless. Where announcements have been made that a wireless system will be available, it has not been implemented into any vehicle yet. Users who already have a grasp of the IOS system of Apple and are comfortable with using a minimized IOS platform should use the Apple CarPlay. Those which are new to using iPhones and its features may find the interface a bit frustrating. Keep in mind that certain apps require you to have an Apple account and so Apple CarPlay is ideal for those which have accounts on iTunes and other Apple based services. Android users and those which are used to using Android based systems are not advised to shift to the Apple CarPlay. As most vehicles come with an Android based infotainment system, it may be more beneficial for these users to utilize the built in system rather than use the Apple CarPLay. Apple users who have large families or for the single driver who has a ton stuff it is not ideal to use Apple Carplay. The reason is that the wire needed to make the system work can be easily damaged if outside objects are placed upon it. Damage to the wire is greatly increased if objects are placed in the console where the wire is housed. Finally, as the functionality of Apple CarPlay is much like the standard infotainment system on the newer model vehicles, it may not be worth the trouble for some to have to learn the CarPlay system. Yes, you can load your lists into the system, but you can do that just as easily on the standard infotainment system by logging into Pandora or your other media based application.